Looks like the band has FINALLY found a venue to host a once-a-month jazz performance of some BIG BAND JAZZ! 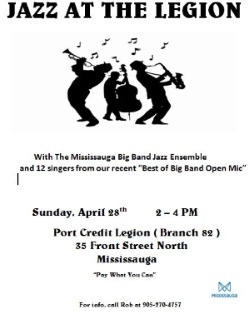 It all starts on Sunday, March 25th from 2 – 4 PM at the Port Credit Legion ( Branch 82 ) 35 Front Street North in Mississauga. Cheap drinks, great view & amazing music! Plus………… it’s “Pay What You Can”. Please come out to support the band and hopefully we’ll be there for a long time. Future shows will be same time / same place on the last Sunday of each month.